World Toilet Day on November 19th is an official day to inspire action to tackle the global sanitation crisis and to promote the Sustainable Development Goal 6 to ensure that everyone has a safe toilet and that no-one practices open defecation by 2030 (read more). One in five Ghanaians have no access to a toilet and defecate in the open, with open defecation rates over 70% in northern Ghana. One of the consequences is diarrhea, where particularly children could die from (read more). 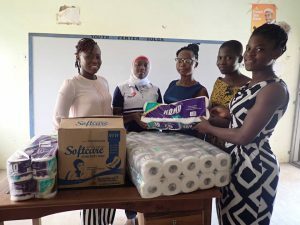 That sanitation is also an issue for the target groups of the YHFG show the actions of two seniorstaff members of YHFG (Augustina Achigibah & Khadija Hamidu) in June 2018, who have donated large quantities of sanitary pads and toilet tissues to the participants of the Girls Remedial School 2018. 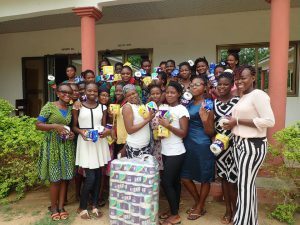 The two staff members were touched by information that some of the girls are unable to afford these basic needs (read more).